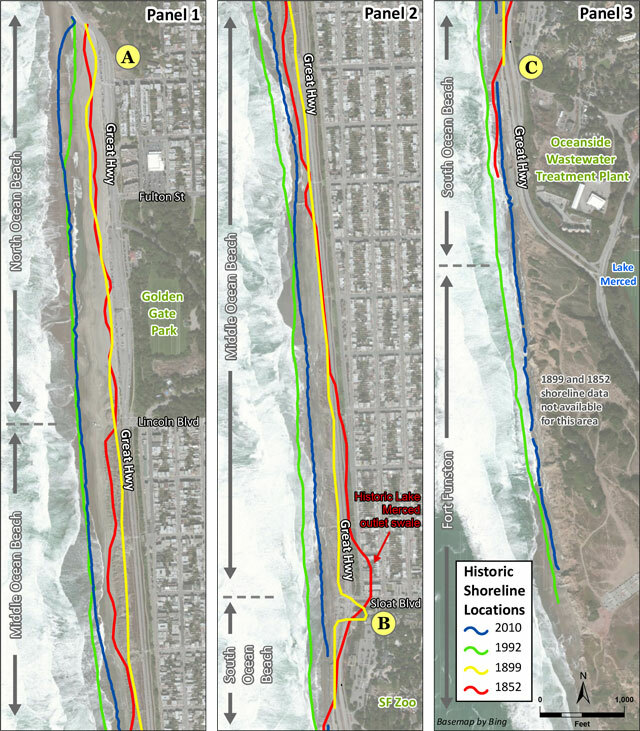 You don’t need a crystal ball to see how encroaching seas will affect San Francisco. “What we’re walking on right now is the former southbound lane of the Great Highway in San Francisco,” says Tom Prete, the founder of the Ocean Beach Bulletin, an online news site that covers the neighborhoods along San Francisco’s Pacific shore. “In the winter of 2010, the city closed this portion of Great Highway because of erosion that was endangering the road,” he explains. The side of the road closest to the beach is now blocked off by concrete barriers. Traffic has been rerouted onto what was once the median, to avoid the receding sandy bluffs. “It was something that was sort of done in an emergency,” Prete says. Now, rather than just reacting to what’s happening out here, San Francisco is planning ahead. 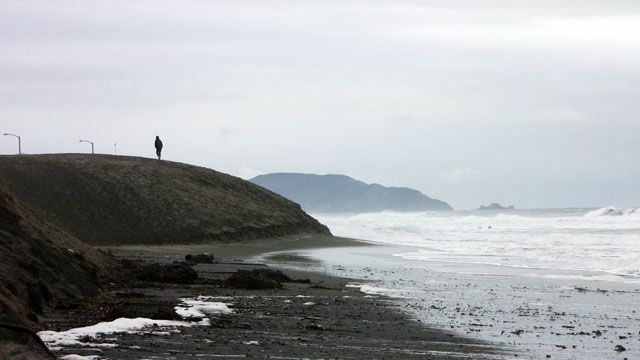 The road map for this more proactive approach is the Ocean Beach Master Plan, a sweeping set of recommendations intended to be implemented over the next few decades as the ocean relentlessly carves away the coast. “It wants this land back,” Prete says. And it’s taking it. Last year the National Academy of Sciences projected that in this part of California, sea level could rise nearly a foot by 2030. And by the end of the century, if current warming trends continue, it could be more than four feet higher. 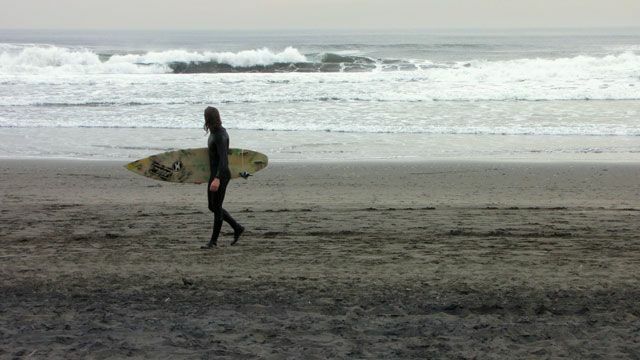 Here at Ocean Beach, no private homes are in immediate danger, but on the line is millions of dollars’ worth of infrastructure: the four-lane highway and a waste water treatment plant. And there’s the beach itself, part of the Golden Gate National Recreation Area, used by surfers, dog-walkers, joggers and bundled up beach-goers (this is not San Diego). Sea level rise is a looming threat, but erosion is nothing new. “It’s at least partially — I would argue, largely — a man-made problem,” says Bob Battalio, a coastal engineer at the consulting firm ESA PWA who is working on the Master Plan. He says the Great Highway isn’t just a casualty here; it’s part of the problem. It opened in 1929 to much fanfare. But it wasn’t exactly built on Terra Firma: the city flattened coastal sand dunes and pushed the shoreline about 200 feet out into the ocean. “It was progress I guess at that point,” reflects Battalio. But the ocean has been pushing back ever since and the Great Highway isn’t looking so great anymore, with pieces of parking lots crumbling onto the beach. The bluffs below it are strewn with sandbags, boulders and concrete: failed attempts by the city to stem erosion. Climate change will make it all worse. The most dramatic recommendation in the Ocean Beach Master Plan is to let go of the pendulum. Under the plan, San Francisco would close one end of the Great Highway, reroute traffic about a half-mile inland, and let the ocean come back. Battalio says it comes down to engineering and economics. The plan would cut down on those kinds of costs, but it isn’t cheap, either. Estimates for completing all the recommendations are just north of $350 million. Funding has come through for some initial studies, but the vast majority of that money has yet to be raised. Two other California cities, Pacifica and Ventura, have both undertaken smaller managed-retreat projects. And other places, including New York City and the states around Chesapeake Bay, are beginning to put together their own climate response plans. For San Francisco, completing the big vision of the Ocean Beach Master Plan is just a first step. Some traffic and engineering studies are underway now, but they’re just the beginning of a decades-long process that will affect the shape of our coast and the lives along it. The plan also will be closely watched by other coastal cities around the United States, as the sea continues its slow but steady rise. Anyone notice the collapse of the hillside in the Presidio on the trail along the ocean? Happened after all of the trees and much other vegetation were removed from the hillside. The hillside north of Baker Beach is in a permanent state of collapse, because it’s all serpentine rock. The vegetation removal probably had no effect. And a mere 100 years after 2100? As oceans swell do due expansion of the water? That’s when the problem becomes extreme. Maybe it would be better to not increase global warming to the tune of $350 million for 100 years of benefit. The dams upstream of San Francisco Bay are holding back massive amounts of sand that a healthy beach and ecosystem need. The problem is the dams. Proof is visit lake folsom in the summer; it is a high desert of sand. This once healthy water reserve is clogged. Two engineering ideas; one costs money and one makes money. 1) retrofit dams so that the silt and sand can pass. 2) Lease the dams to the mining companies so they can sift the blocked sediment and sand for valuable minerals. The erratic rains will move the sand and silt downstream. The violent tidal forces around the bridges will make sure the ships will have clearance. 3) increase pollution and gas taxes to fix all SF infrastructure/public education. This will reduce pollution and global warming. 4) increase taxes on high social cost professions like lawyers, drug dealers, tattoo artists, …. 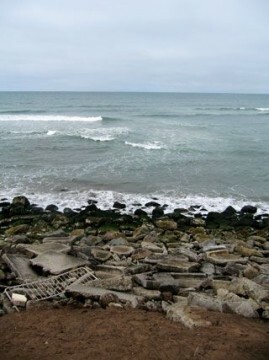 Spend money making ocean beach a local treasure like San Diego, Cancun, and Florida beaches. 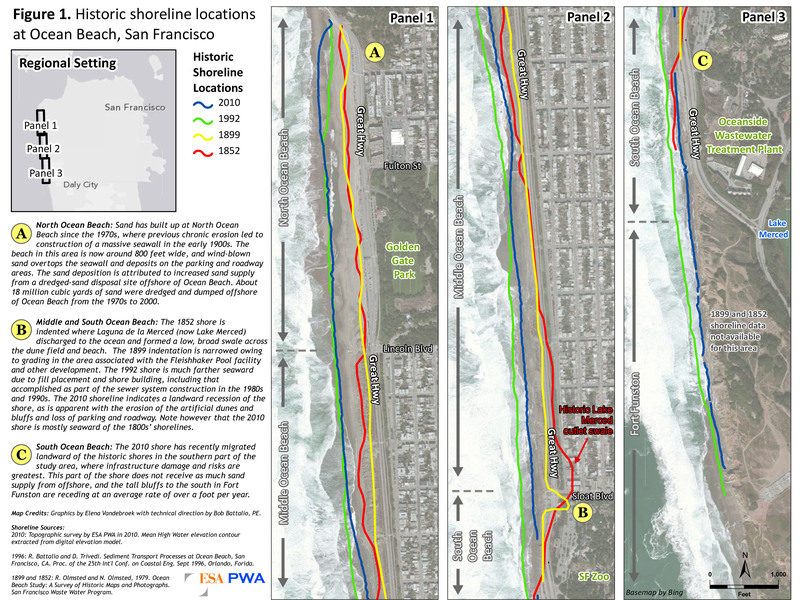 Where do I find the 20″/50″ sea level rise map of SF bay?